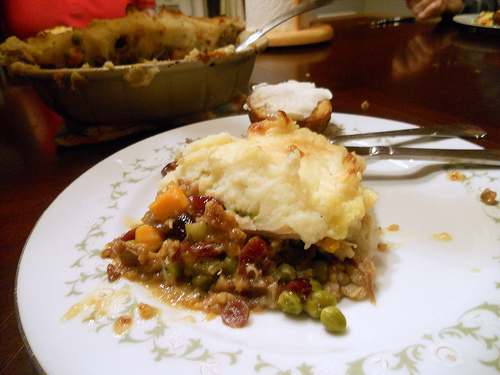 Warm and filling, this "shepherd's" pie is brimming with Thanksgiving flavors. I realize that most turkeys and chickens do not require Shepherds, but please just go with it for the sake of the season and the mashed potatoes. 2 each medium Yukon Gold and Russet potatoes (you can use all of one or the other, I'm just letting you know what I did). If you're using cold, leftover stuffing, cut it into kind of manageable 1" chunks. Put in the bowl of a food processor. Add 1/4 cup of stock and pulse until it still has some texture but isn't too chunky. Test to see if it is still crumbly. If it is, add the other 1/4 cup of stock and pulse again.This stuff will be sticky, so look out. Spray a deep-dish pie pan lightly with pan spray. Dump the stuffing into the pan and roughly press it out with the back of a spatula. Lightly spray this with pan spray so you can work with it, then press the stuffing in the pan and up the sides trying to make it look as nice as possible. It should be about 1/4" thick. Bake in a 350F oven for about 30 minutes, until the crust is dry on top and has taken on some color. If any of it has slumped, you may have to futz around with it a bit once it comes out of the oven. Just press it back in place with a spatula or something. It will be fine. Set aside. Peel and cut the potatoes into 1" dice (more or less) and place them in a pan of cold water. Add a healthy sprinkle of salt and several grinds of black pepper to the water. Bring to a boil and then reduce heat. Let the potatoes simmer about 12 minutes until tender. Check by stabbing them with a knife. They should offer no resistance. Resistance is futile. Drain off all the water, put the lid on the pan and let the potatoes dry over medium-low heat for about 5 minutes. Mash the potatoes with your favorite masher. Add a bit of salt and pepper and the butter and mash well to combine. Taste for seasoning and add the milk, a bit at a time, until you like the consistency. Add more salt and pepper if necessary. Cover and set aside to stay warm. Heat a large saute pan over medium heat until hot. Add the fat. When it is melted and shimmering, add the onions, carrots and celery (mirepoix) to the pan along with a heavy pinch of salt, freshly ground black pepper, and the poultry seasoning. Stir and saute for about 5 minutes until the vegetables are softened and somewhat translucent. Stir in the flour and cook, stirring, for another 2 minutes or so. The mixture will seem very dry. If you want to add a bit more fat, you can. It's your call. Pour in the stock and bring to a boil. The mixture will be quite thick. You can add a bit more stock if you want, if you want your final pie to have a bit more gravy in it. Personally, I think thicker is better. Add in the sweet potatoes and cook, stirring, for about 5-7 minutes, just to give them a head start since they're kinda hard. Stir in the meat, peas and cranberries and stir everyone around for a minute. Spread the filling evenly in your stuffing crust. Top with the mashed potatoes, making it swirly if you want. Tent the pie with foil and bake at 400F for 30 minutes. Remove the foil and bake for 30 minutes more at 375F. Take the pie out of the oven, tent with some foil, and let set up about 15-20 minutes before slicing and serving.